When I think of planning, I always remember a quote that is attributed to Abraham Lincoln. "Give me six hours to chop down a tree, and I will spend the first four sharpening my axe." The point is that if you spend adequate time preparing to do the job, the job itself will go much smoother/better/faster. What do our customers want us to do? What are the steps we are going to use to actually move it? What process will be needed? (Hint: Lean Six Sigma). Communicate that the plan exists and why it is important. Make the plan visual using graphs, charts and scoreboards. Chart where the progress is vs. where we want it to be. Evaluate that the plan is yielding the results you intended. Provide team updates and progress reports. Include this on all monthly and quarterly reports. Communicate and post the results to date on the visual boards. Celebrate and communicate success as you find it. Hold people accountable for the progress. Refocus on areas where progress is not up to par. Adjust the plan if the success isn’t in line. 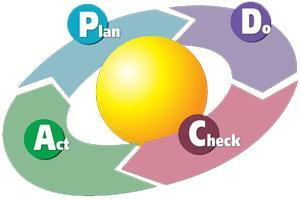 Add or take away from the plans if/when the business needs change. Throughout the year, there should be information moving through the organization from senior management to the shop floor and vice versa. 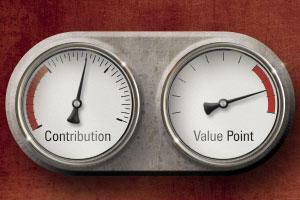 As business needs change, some of the metrics and measures might also need to change. As the improvements are made, the results need to be included in the information being shared. This creates a very clear and reliable source of alignment to again reinforce the need to keep all resources pointed in one direction. This clarity of purpose will drive the organization to improve those key metrics that are most important to the customer. The alignment of the effort drives synergy, teamwork and ownership. The communication helps break down walls and focus the organization on the right parts of the business. The combination of these items will most certainly yield high-impact results. When instructing Noria’s Fundamentals of Machinery Lubrication course, I usually ask my students to tell me the type of grease that they currently use at their facility and not to give me a color. Most technicians understand that color doesn’t reveal much about a grease’s properties, but they don’t always answer correctly with the base oil viscosity, thickener and consistency. 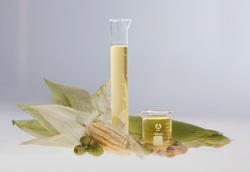 Of course, greases are formulated with oil, thickener and additives. While you may be familiar with the formulation of grease, do you know what grease consistency means and how it should influence your grease selection? Grease is formulated with up to 95 percent base oil. Most greases today use mineral oil as their fluid components. These mineral oil-based greases typically provide satisfactory performance in most industrial applications. In temperature extremes (low or high), a grease that utilizes a synthetic base oil will offer better stability. The thickener is a material that will produce the solid to semifluid structure in combination with the selected lubricant. The primary types of thickeners used in grease are metallic soaps. These soaps include lithium, aluminum, clay, sodium and calcium. Lately, complex thickener-type greases are gaining popularity. They are being selected because of their high dropping points and excellent load-carrying abilities. Complex greases are made by combining the conventional metallic soap with a complexing agent. The most widely used complex grease is lithium-based. These greases are made with a combination of conventional lithium soap and a low-molecular-weight organic acid as the complexing agent. Nonsoap thickeners are also gaining in popularity for special applications, including high-temperature environments. Bentonite and silica aerogel are two examples of thickeners that do not melt at high temperatures. However, there is a misconception that even though the thickener may be able to withstand the high temperatures, the base oil will oxidize quickly at elevated temperatures, thus requiring a frequent relube interval. Notice in the table below how much the thickener percentage affects grease consistency. Keep in mind that there is a substantial amount of oil in the grease and that field conditions can also influence grease consistency. Grease consistency depends on the type and amount of thickener used along with the viscosity of its base oil. A grease’s consistency is its ability to resist deformation by an applied force. The measure of consistency is called penetration, which is contingent on whether the consistency has been altered by handling or working. 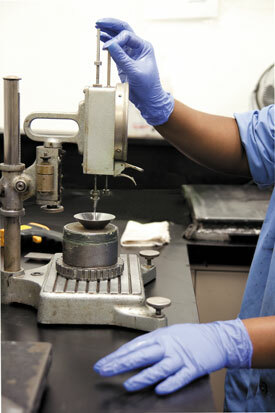 ASTM D217 and D1403 methods are used to determine the penetration of unworked and worked greases. To measure penetration, a cone of a specific weight is allowed to sink into a grease for five seconds at a standard temperature of 25 degrees C (77 degrees F). The depth, in tenths of a millimeter, to which the cone sinks into the grease is its penetration. A penetration of 100 would represent a solid grease, while a penetration of 450 would be semifluid. The National Lubricating Grease Institute (NLGI) has established consistency numbers or grade numbers from 000 to 6 that correspond to specified ranges of penetration numbers. Certain conditions will affect the consistency required for a grease. 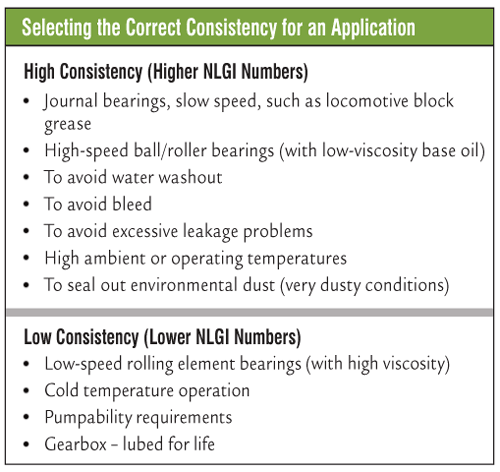 The table below can help you select the correct consistency for an application. Undisturbed - Grease that is in its original container. Unworked - A sample that has received only minimal disturbance in being transferred from the sample can to the test cup. 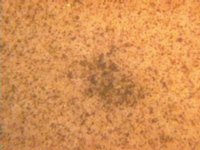 Worked - A grease that has been subjected to 60 double strokes in a standard grease worker. NLGI classification is based on worked penetration. Prolonged Worked - Grease that has been worked the specified number of strokes (more than 60), brought back to 77 degrees F and then subjected to an additional 60 double strokes in the grease worker. Block - This is the penetration of a block grease, which is hard enough to hold its shape without a container. Additives can play several roles in a lubricating grease. These primarily include enhancing the existing desirable properties, suppressing the existing undesirable properties and imparting new properties. The most common additives are oxidation and rust inhibitors, extreme pressure, anti-wear and friction-reducing agents. In addition to these additives, boundary lubricants such as molybdenum disulfide (moly) or graphite may be suspended in grease to reduce friction and wear without adverse chemical reactions to the metal surfaces during heavy loading and slow speeds. It’s important to note that speed and load help determine the proper viscosity required for an application. Remember, viscosity is the most important property of a lubricant. Whenever you are selecting grease, you must also take into consideration the application and match the required consistency to ensure that you provide the equipment with the best choice to improve equipment reliability. Typically, answers to these questions might include: “The end of life comes when the bearing or bearings are no longer fit for their intended purpose,” or “When it stops rotating.” Unfortunately, these answers are neither specific nor adequate. In bearing manufacturers’ catalogs and most engineering design books, the phenomenon that limits bearing longevity and reliability is termed rolling-element fatigue. This phenomenon has been studied for more than 120 years beginning in the 1890s with the pioneering work of Richard Stribeck in Germany, as well as the early part of the 20th century with John Goodman in Great Britain and Arvid Palmgren in Sweden. Palmgren’s contributions probably were the most significant to rolling-element bearing technology. In 1924 he provided the foundation for rolling-bearing life calculation. He articulated that bearing life was not deterministic but rather distributive. He meant that no two bearings in a group run under the same conditions or will fail at the same time. He proposed the concept of an L10 life or a time at which 90 percent of a population of bearings will survive and where 10 percent have failed. He was perhaps the first person to propose a plausible approach to calculating the life of a machine element. The source of most engineers’ practical knowledge of ball and roller bearings comes from bearing manufacturers’ catalogs. For about 90 to 95 percent of machine design applications, the equations and recommendations in the bearing manufacturers’ catalogs provide for safe and reliable design. Usually, the remaining 5 to 10 percent of the applications require specialized knowledge and analysis to avoid problems. The ultimate failure mode limiting bearing life is rolling-element fatigue of either a bearing race or a rolling element. Rolling-element fatigue is extremely variable but is statistically predictable depending on the steel type, steel processing, heat treatment, bearing manufacturing and type, lubricant used and operating conditions. and ball (right) from 120-millimeter-bore ball bearings made of AISI M-50 steel. The failure manifests itself as a spall that is limited to the width of the running track and the depth of the maximum shearing stress below the contact surface. 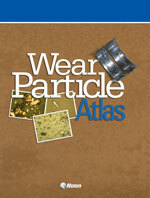 The spall can be of surface or subsurface origin. 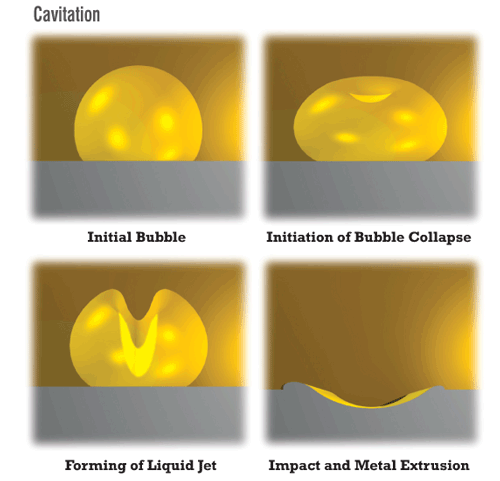 A spall originating at the surface usually begins as a crack at a surface defect or at a debris dent that propagates into a crack network to form a spall. A crack that begins at a stress riser, such as a hard inclusion below the running track in the region of the maximum shearing stress, also propagates into a crack network to form a spall. Fatigue failures that originate below the contacting surface are referred to as classical rolling-element fatigue. Failure by classical rolling-element fatigue is analogous to death caused by old age in humans. Most bearings, however, are removed from service for other reasons. Failures other than those caused by classical rolling-element fatigue are considered avoidable if the bearing is not overloaded and is properly designed, handled, installed and lubricated. With improved bearing manufacturing and steel processing along with advanced lubrication technology, the potential improvements in bearing life can be as much as 80 times that attainable in the late 1950s or as much as 400 times that attainable in 1940. As mentioned previously, the L10 life, in millions of inner-race revolutions, is the theoretical life that 90 percent of a bearing population should equal or exceed without failure at their operating load. It is based on classical rolling-element fatigue. The “basic bearing life” often referred to in bearing manufacturers’ catalogs is the L10 life without life factors, which are dependent upon the bearing type, bearing steel, steel processing, heat treatment, lubricant and operating conditions. a surface-initiated crack network from a surface defect. Most bearings are selected and sized based on the “basic bearing life” calculated with and, at times, without life factors. The caveat is that on or before this calculated time, 10 percent of the bearings operating under this load and speed can be expected to fail. Many engineers do not realize that the life they have calculated is based not on the time before which no failures will occur but on the time before which 10 percent of the bearings can be expected to fail. This mistake can result in warranty and product liability claims for the equipment manufacturer. Since it can be assumed with reasonable certainty that any rotating machinery will have two or more bearings comprising the system, you must also determine the bearing system life in addition to individual bearing life. This can be achieved by combining the individual bearing lives into a single life for the system. To establish system life, an understanding of strict series reliability is required. Remember, the life of the bearings as a system is always equal to or less than the life of the shortest lived bearing in the system. For example, say you have a simple speed-reducer gearbox with two bearings supporting the input gear running at 3,600 rpm and an output gear supported by the same two types of bearings running at 900 rpm. At full (100-percent) load or torque, the lives of each of the input bearings are 2,500 hours, and the lives of each of the output bearings are 10,000 hours. The 10-percent life of the system would be calculated to be 1,124 hours. This means if you distributed 1,000 gearboxes and they were all operated at maximum torque for 1,124 hours, 100 gearboxes would have at least one bearing failure. The question then becomes how long could you operate the gearbox at this condition without a failure. If the life of the shortest lived bearing in the system is 2,500 hours, it can be reasonably expected that for the first 133 hours of operation for each gearbox there will be no bearing failure. However, the gearboxes may not be operated at full output torque at all times. Assume that the gearboxes operate at full torque for 50 percent of the time, one-half torque for 30 percent of the time and one-quarter torque for 20 percent of the time. In order to calculate the total system life, you would need to calculate the L10 system life at each condition. At an L10 system life equal to 2,671 hours, 10 percent of all the gearboxes in service would theoretically have one or more failed bearings. If, as in the previous example, you have 1,000 gearboxes in service and have 100 failed gearboxes, you would have 100 failed bearings out of the 4,000 bearings in service. In other words, 2.5 percent of the bearings in service that have failed account for 10 percent of the failed gearboxes. The other 97.5 percent of the bearings in service can reasonably be assumed to be undamaged and usable. This is why the vast majority of undamaged bearings removed from service have never reached their calculated L10 life. Therefore, it becomes practical and cost-effective to inspect, rework and place back into service those undamaged bearings that were removed before reaching their L10 life. So far this discussion has been based on classical rolling-element fatigue as the sole mode of failure and bearing removal. However, probably less than 5 percent of bearings are removed from service because of rolling-element fatigue, whether of subsurface or surface origin. 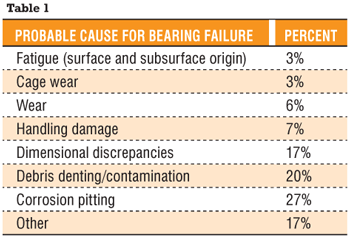 Table 1 features a list of probable causes for bearing removal and an estimated percentage related to each respective cause. 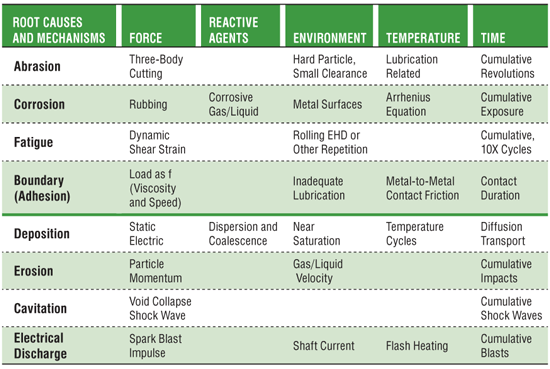 In addition to this list of causes for bearing removal, related failure modes categorized under “other” would include bearing misalignment, true and false brinelling, excessive thrust/bearing overload, lubrication, heat and thermal preload, roller edge stress, cage fracture, element or ring fracture, skidding damage, and electric arc discharge. These causes for bearing removal and failure can be minimized and/or mitigated by good bearing design, proper bearing installation, timely maintenance and good lubrication practices. However, they cannot be eliminated entirely, which makes understanding and determining bearing life even more important.